The NIAB site has outline planning permission for development and will be built on. I believe there is still an opportunity as detailed plans are developed in advance of a full planning application to make sure that what is built is what is needed and that development does not adversely affect existing residents particularly in terms of traffic and flooding. 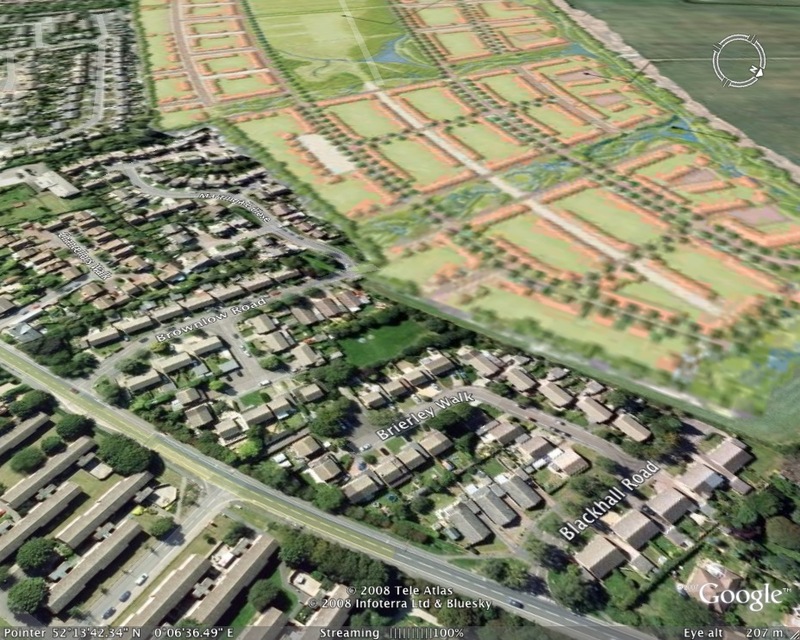 The below image shows part of the site from a point of view above King’s Hedges Road, with Blackhall Road, Brownlow Road, Brierley Walk, Martingale Close and Cavesson Court in the foreground. Buildings are to be up to four storeys high, with the taller buildings nearest existing homes, apparantly to preserve the appearance of the city from afar. I would give a higher priority to the overshadowing, overlooking and general intrusion on existing residents than the appearance of the city as you approach it. I would also question if four story blocks of flats are what are needed in this location, I would have thought it an area more suited primarily to family homes mixed with other properties as seen in the surrounding area, high density housing developments on the edge of the city do not in my view make good sense. Parts of the site are quite central therefore more suited to a higher density of housing than those at the Histon end of Histon Road. If there is to be a path for through traffic on estate roads in the centre of the development steps will need to be taken to prevent the use of the road by though traffic from the Huntingdon Road/Girton area wishing to travel to the East of the City or East on the A14. An alternative would be for the main road on the development to be a non-estate, classified road, situated to the outer edge of the development. However while I think such a link road from Huntington Road to Histon road is needed I do not believe it would ideally be situated within the boundaries of the current site. It is worth noting here that the existing dead-end roads which appear to have been built with further development in mind at Woodlark Road, Windsor Road, Brownlow Road and Blackhall Road are to be used only for cycle and pedestrian access. Do we want “Toytown” red and blue houses as we’ve got on Arbury Park? Could the broadband connections be fibre optic? Compared to the quality of development you would get in Devon or Oxfordshire the East of England appears to be getting cheaply built rubbish, surely central Cambridge deserves better. This entry was tagged Cambridge, Development, Girton Interchange, Guided Bus, Histon Road, Huntington Road, NIAB Site, Transport on March 11, 2008 by Richard Taylor.